We wrapped up our school year a few weeks ago, so it was with great fun we received a Kindercone to review around the same time! I have heard of Kindercones in the past, and put together something similar when my boys started 1st grade, so I was interested in seeing this product. 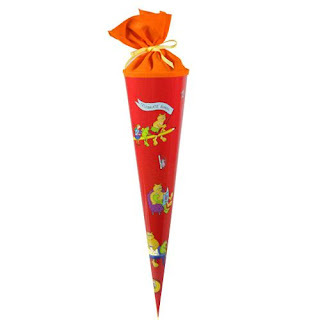 Basically, it's a German tradition of receiving a cone of goodies for kids moving from Kindergarten into First Grade. The cone we received was very large and colorful! It included some pencils, a sweet stuffed animal (which Lydia loves and took as her own immediately), some tattoos and a journal for first grade. I added some small notebooks and candy to the cone before I presented it to my children. It is definitely cute, and a sweet gift to receive at the end of a long school year. You can purchase them filled with goodies, or empty from the Kindercone website. They also sell smaller ones, and plain white ones which would be a fun party favor. They are a perfect gift for this time of year, or even in the weeks leading up to a new school year. Seven Years Ago . . . Date Night Tonight with Jason Aldean! Jason Aldean? Yep, the Big Green Tractor Song! The Circus Is Coming to Phoenix! !